Otters are members of the carnivore family that include weasels, skunks and ferrets. The Asian small-clawed otter have only partial webbing between their toes, and small blunt peg-like claws compared to other otter species that have fully webbed feet and strong well developed claws. Otters at the park share the same living quarters as the gibbons where they are regularly seen flocking in the moat surrounding the enclosure. In the wild, they prefer freshwater and brackish habitats such as rivers, estuaries and coastal waters but they do spend a considerable amount of time out of the waters too. The are known to travel long distances between waterways and when they find a suitable territory, they will defend it fervently by using their scent. 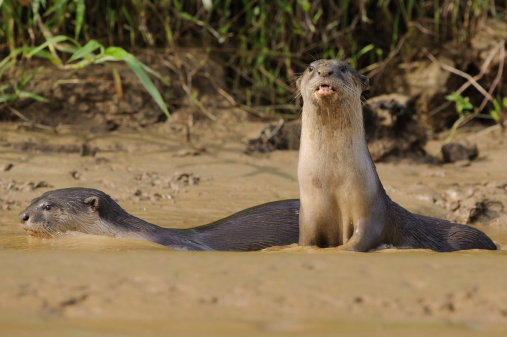 Each other has a unique scent which is used to communicate with other otters. They also make a range of calls to communicate. They have sensitive paws which enable them to locate prey at the bottom of river beds. Their diet consists mainly of crustaceans, mollusks and frogs.